The controversy over the upper Chattooga boating issue dates back to around 2001, and centers on permitting boating in the Chattooga headwaters, and building new access trails into the upper Chattooga River. The Chattooga Conservancy is not opposed to boating in the upper stretches of the Chattooga River. We supported starting at existing access just upstream of the Bull Pen Bridge, year-round at water levels above 450 cfs at the Burrells Ford gauge, down to the Hwy. 28 access. We were opposed to building new access trails above Bull Pen Bridge, where 70% of the rare plant and animal life exists in the entire river corridor, and where the Forest Service proposed to build 4 new access trails. We agreed that even though boating use would probably be minimal in this section due to the fact that most of the desirable whitewater is below Bull Pen, we also recognized that new access trails would be for a host of additional users. This remote, sensitive area, we felt, would be harmed by the steady increase of all new users of the 4 new access trails. Simply put: Too much access kills wildness. Beginning in the late 1990s, whitewater lobbying groups mounted a campaign to pressure the Forest Service into providing unrestricted access to the headwaters portion of the Chattooga Wild and Scenic River. The headwaters section of the river had been “zoned” off-limits to boaters, starting with the first Forest Service management plan for the Chattooga after its Wild & Scenic designation. Then, as an offshoot of the 2004 Sumter National Forest Plan revision, and after years of extensive litigation and charged public involvement, in 2012 the Forest Service issued an environmental assessment called Managing Recreational Uses in the Upper Chattooga (Recreation EA), with a finding that boating in the upper Chattooga would have no significant environmental impacts. While the Recreation EA officially permitted boating in the upper Chattooga (with seasonal, flow and group size restrictions), it left the question of access—namely, where specific boater access trails would be designated—for later analyses. This assessment would come to fruition in January of 2015 as the Chattooga River Boating Access Environmental Assessment (Boater Access EA), which proposed building new access trails at Green Creek, Norton Mill Creek, Bull Pen Bridge, Burrell’s Ford and Lick Log Creek, for boaters and foot traffic. The Chattooga Conservancy took issue with constructing so many new trails into the upper Chattooga Wild & Scenic River Corridor. Our first concern was for the fate of the Chattooga Cliffs reach, due to the proposed trails at Green Creek and Norton Mill Creek. 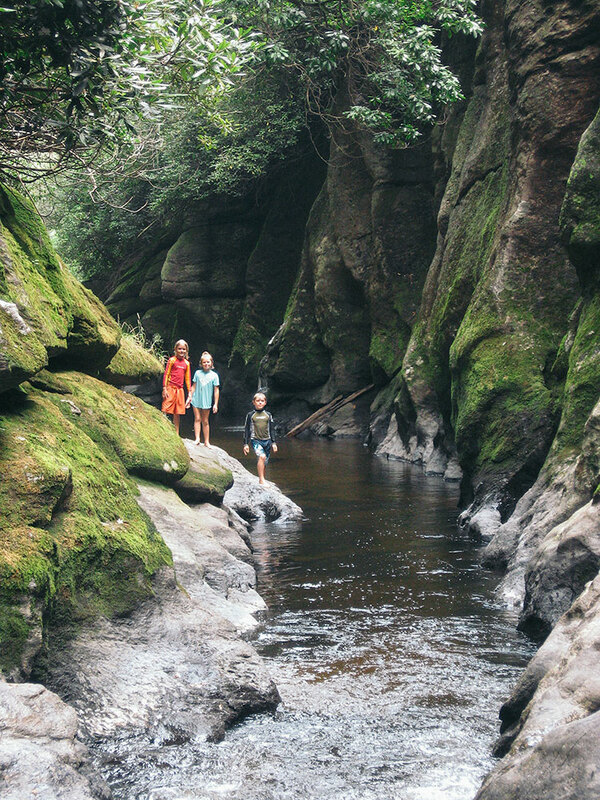 Here in the Chattooga’s remote headwaters, there exists a unique backcountry experience where one can find solitude as well as the most biologically rich place in the whole Chattooga River corridor. New trail construction would undoubtedly funnel more people into the once-remote headwaters and also result in the creation of countless new user-created trails, which would degrade and damage this fragile resource. Then, there was also the proposed construction of a boater take-out trail at Lick Log Creek, which would require paddlers to carry boats for about 1 mile along a heavily used hiking trail to reach a parking area. This made no sense, because there is already a major access point just a few miles downstream near the Highway 28 Bridge, which already has a large parking lot and boat ramp to the river. So we supported boating from Lick Log down to the Hwy. 28 take out. We also took issue with the Forest Service’s proposal to construct a new boater access trail below the Bull Pen Bridge, into the Ellicott Rock Wilderness Area, and to block the user-created access trails to the swimming area that is directly below the bridge. To read our comments and objections to the Boater Access EA, click here. 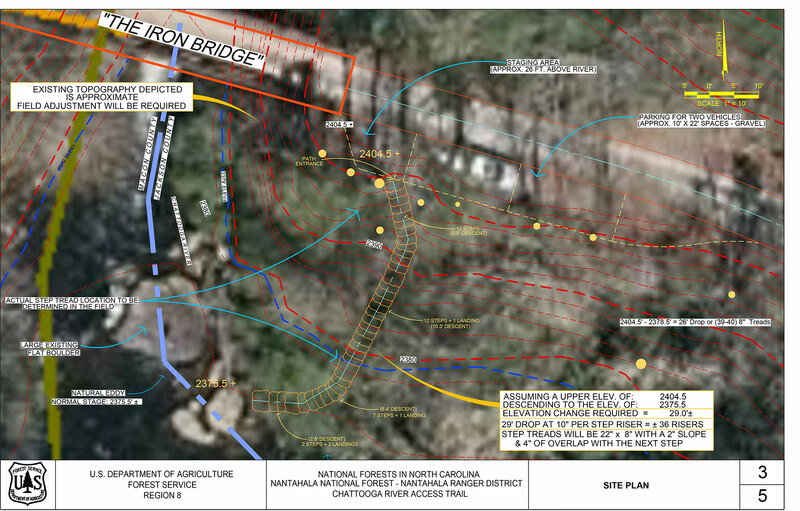 Our argument was simple: Access downstream of the Bull Pen Bridge could be via an existing user-created trail, which would also be designed to correct the resource damage from all of the user-created trails there. After negotiations and site visits, the Forest Service finally agreed to construct steps down an existing trail directly downstream of the Bull Pen Bridge, to prevent further erosion while also providing access to the river just below the bridge. To see a map of the new access trail, click here. Currently, the Forest Service has installed the steps below the Bull Pen Bridge, but has not acted on building any of the new access trails. The Forest Service’s decision permits paddling the upper Chattooga under certain conditions: December through March, from Green Creek to Lick Log Creek, at water levels above 350 cfs at the Burrells Ford gauge. The final outcome of the lengthy upper Chattooga boating controversy cost taxpayers considerably in dollars spent by the Forest Service for several environmental assessments, as well as court expenses as a result of challenges by special interest groups, who sued the Forest Service to force building new access trails into the upper Chattooga River. Thanks to our efforts, at least the Ellicott Rock Wilderness area near Bull Pen Bridge was spared from an unnecessary new access trail.